Congress: The general assembly meeting. Council: the governing body managing APGF's operations. Global Greens: The partnership of the world’s Green parties and political movements working cooperatively to implement the Global Greens Charter. The Global Greens are organised into four federations, in the Americas, Africa, Europe and Asia-Pacific, who work together to manage the Global Greens' development and each have three full and three alternate representatives serving in the Global Greens Coordination. The current APGF Full-representatives to the Global Greens are Keli Yen (Taiwan Green Party), Liaquat Ali Shaikh (Pakistan Green Party) and Suresh Nautiyal (Uttarakhand Parivartan Party, India). The alternates are Ballav Timalsina (Nepali Greens) and Masaya Koriyama (Greens Japan). In May 2000, 30 people representing 12 Green parties and political movements in Asia and the Pacific met for the first Asia Pacific Green Politics Workshop in Brisbane, hosted by the Australian Greens. A big contingent came to the Global Greens conference in April 2001, and some to the European Greens meeting in Berlin in 2002. At each step, there was discussion on the need to formalise and strengthen the Asia Pacific Greens Network with a follow-up conference. Global Greens Congress 2001 was held in Canberra, Australia from 14-16 April, preceded by a meeting of Global Young Greens on 7-9 April, and the Rio+10 International Workshop, on 12-13 April (a collaboration between the Heinrich Böll Foundation, Friends of the Earth Australia and the Green Institute). Over 800 people attended from more than 70 countries. The Global Greens Charter, our founding statement of principles, was negotiated and adopted by acclamation, after years of negotiation and days of Congress debate. Resolutions to establish communication and decision-making mechanisms were passed, enabling formation of the Global Greens Coordination and the Global Greens Network. This was the first truly global meeting of the Greens and it was amazing! At the outset of the new century the Greens were positioned to play an important role in the politics of the 21st century. 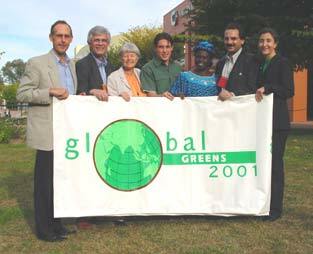 Watch the video from Global Greens 2001. Simple operational rules, a membership panel and membership accreditation mechanism. Affirmation of commitment to the Global Greens Charter and work towards its implementation. Formal membership to the Global Greens Coordination to actively participate in the Global Greens' organisational and political activities. Establishment of an APGN online forum to facilitate information exchange and networking between APGN members. human rights and participaotory democracy underpinned by the core principle of mutual understanding through dialogue and networking. a proposal to form the Asia Pacific Young Greens Network. Full reports on the Kyoto meeting can be found here. The 2005 1st APGN Congress in Kyoto adopted simple rules, including a set of basic criteria for membership and a Membership Panel to consider applications from Parties and Groups seeking membership status. However, it was not until the lead-up to GG08, the Global Greens Congress in 2008 in São Paulo, Brazil, that a significant number of membership applications were received. No doubt this resurgence of interest was driven by the need to be a member of a federation in order to have voting rights at São Paulo. During this time nine Parties and Groups from six different countries were granted full membership status, with others given “Associate Membership” or “Friends of the APGN” status as a result of either incomplete applications, or the organisation not meeting the membership criteria. The 2008 Global Greens Congress in São Paulo, proved to be a significant milestone in the development of the APGN. A large number of participants from the Asia Pacific region attended the Congress, including groups of more than 10 participants from Australia, Japan, Pakistan and Taiwan and smaller numbers from a range of other countries. Participants from the region contributed significantly to the proceedings of the full Congress and also took part in a number of APGN meetings held during the Congress. In particular, two very successful APGN workshops were held (with about 100 participants) at which very positive discussions took place on the building of the network. In addition, the Membership Panel met on a number of occasions during the Congress. Among the outcomes of these sessions was the adoption of mechanisms for consolidating the structure for the APGN itself. As a result two email lists were created to support ongoing discussion. The Delegates group served Full Members only, 3 delegates per country. An APGN forum, served as a discussion space for the general APGN community. 2010: Asia-Pacific Greens Network's 2nd Congress: Taipei, Taiwan. Over 200 people attended, including representation from 17 Asia Pacific countries, 22 organisations from 15 countries who were undergoing the process of applying for APGN Membership. There were also many individuals and organisations attending from sympathetic political parties, community groups, governments or businesses – these people were interested to learn more about Green Parties in the region and the issues being discussed during the three day Congress; and over eighty young Taiwanese assisting the Congress in every possible way as volunteers. Specifically, attendees to the congress originated from Taiwan, Australia, Japan, the Philippines, Korea, India, New Zealand, Pakistan, China, Hong Kong, Indonesia, Mongolia, Nepal, Papua New Guinea, Sri Lanka, Tuvalu, Tibet, the Federated States of Micronesia and Fiji; and a number of observers from Greens Parties in Egypt, Germany, France, UK, Switzerland, and the USA. The Congress provided an opportunity for people interested in the growth of green policies and reform to discuss how to build a new generation of green decision-makers in the region and how to develop the influence to promote reform. To lay groundwork for the growth of vibrant Green parties and elected decision-makers in the region. To empower Green parties and groups through meeting and exchanging ideas with a vibrant network of peers. To formalize new rules for the operation of the Network and to develop an ambitious but achievable 5-year strategic plan. To promote understanding of the differing political contexts in which groups are working. To discuss region-wide collaborative partnerships and campaigns that can strengthen the network. To generate more reform action by policy-makers in the region. Seventeen resolutions on issues including climate change and renewable energy, governance, Asia Pacific conflicts, the Himalayan region and Tibetan water issues, depleted uranium and nuclear power in the region, Antarctic Whale sanctuary, hightech industries and Green growth, and more. Over 400 Greens from 76 countries attended Dakar 2012, the third ever Global Greens Congress - and the first in Africa. Delegates discussed issues such as democracy, biodiversity, climate change and the future of the Global Greens movement, and adopted a series of resolutions (http://www.globalgreens.org/dakar2012/resolutions) to pave the way to a stronger and more cohesive green politics worldwide by shaping policies made by the 296 Parliamentary seats held by Greens at the national level in 2012 and will shape the ideology of nascent green grassroots movements around the world. In the lead-up to the congress an important and first-ever census was conducted of Global Green members, including interviews with key stakeholders, a review of party international best practices, a review of academic literature, and produced a strategic report on the future function, structure, and resourcing of their organisation, see report attached below. Solidarity towards world populations like Tibetans and Syrians was unanimous, underlining democratic society and respect for human rights as central to green politics. The Global Greens also addressed the issue of Bhopal in a workshop, which resulted in a resolution accepted unanimously asking for the full accountability of Dow Chemical for the 1984 gas leak, one of the world's worst ever industrial catastrophes. The Global Greens Charter was amended as well to include opposition to war crimes and sexualized violence. An APGN Secretariat office equipped with staff dedicated to professionalizing our nascent institution, scaling up work through structures that ensure accountability, transparency and learning. The Secretariat would be responsible for the operational and administrative affairs of the APGN. An Asia Pacific Green Foundation dedicated to fundraising and expanding the diversity and quality of services to Greens in our region. Establish a collaborative platform to facilitate more Green electoral wins. Establish an APGN office to coordinate ideas and resources. Establish an Asia Pacific Greens Foundation to raise money and give support to members and fledgling Green movements. Build unity & trust among all Green parties. Increase the number of members and supporters of Green parties. Provide election support to APGN members. Build closer ties between our organisations. 1. A well informed APGN; 2. Ability to work locally, nationally and Internationally. Stronger parties through training & information: 1. Membership recruitment, 2. Running Elections. Better leverage the existing website to share resources and expertise. More exchanges between parties in the APGN. Effective database / e- library in various languages. Case studies: 1. Sharing obstacles & ideas, 2. Mentorship exchanges. Mobilize a research group to bring information and discussion. Improve information, resource and document sharing. Identify main priority issues of the region and jointly raise our voice. Be clearer on our Green political ideology: 1. Turn ideas into credible policies & laws, 2. Create achievable & inspirational political goals. Help each part identify, develop & execute their political strategy. Held in Wellington, New Zealand from June 12-14. The APGF Network officially passed the APGF Constitution, and became the APGF Federation. Details about all the workshops and resolutions passed at this congress can be found at the Congress Website. Held in Liverpool, United Kingdom from 30 March - 2 April 2017. This was the first ever joint-congress between the European Green Party, the Green Party of England and Wales and the Global Greens; and was the largest gathering of Greens in history. The Asia Pacific Green Federation were involved in all aspects of the Global Greens Congress, with a large contingent from APGF member countries attending. APGF put together a 6 minute video which was shared as part of the opening ceremony, which you can watch here. We also put together a newslettter with some of the highlights for APGF from the event. Details about all the workshops and resolutions passed at the Congress can be on the Congress Website.